Jack Cheesman was born on 19th September 1889 in Watersfield, Pulborough, West Sussex. Jack is first found in the 1891 Census as a one year old boy living with his parents and his elder sister at Morley Farm, Bury, West Sussex. Jack was the second child of his father Charles and mother Alice Beatrice Cheesman. His father was a Hay Tyer. Charles and Alice Beatrice Lee married in 1887. Lillian Cheesman is Jack’s elder sister who is two years his senior born in the last quarter of 1887. The 1901 census found Jack, who is now 11 years of age as a schoolboy living with his mother at 1, South Street, Cold Waltham, West Sussex. His mother Alice is living on “Parish Relief”. Lilian is a 13 year old servant living in Finchley. Charles Cheesman, the father died in 1887. Three other children are born to the family prior to his death; Ethel, Laura and Elsie. Elsie died in 1910 at the age of 12 years old, the reason is unknown without purchasing the death certificate. According to the UK Railway Employment Records 1833 to 1956, Jack is employed as a Porter at Warnham and Ockley Railway Stations between 3rd July 1906 to 24th September 1909 when he resigned his post. The 1911 Census finds Jack at 21 years living with his mother at Laurel Cottage, Pulborough, West Sussex. Jack is a Hay Presser. His mother is a children’s nurse which is reflected in two child boarders at the property. Lilian has returned to live at home and is unmarried. On 25th March 1912 Jack became a Police Constable with West Sussex Constabulary aged 23. 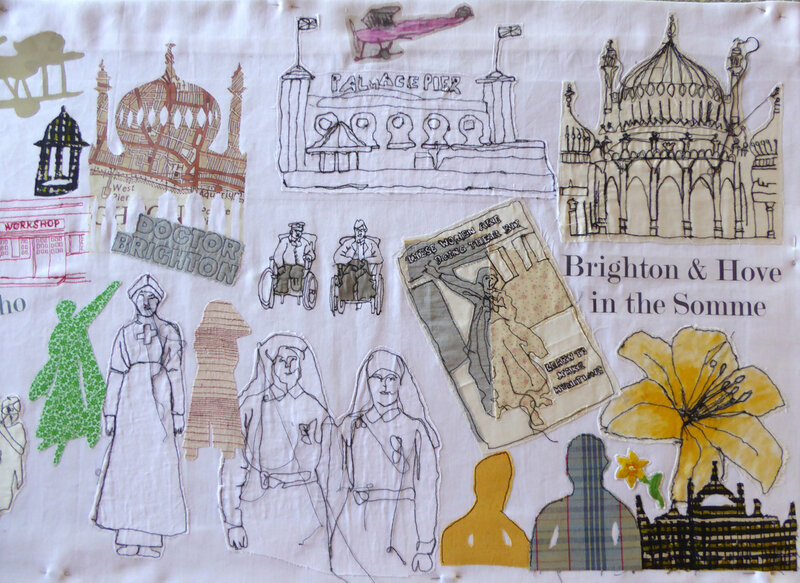 On 1st April 1914 Jack became a Police Constable with the Brighton Borough Police Force. Jack applied to the then Chief Constable of Brighton Borough Police William Gentle for permission to join the Army. Permission was granted to leave on 11th May 1815. Jack attested on the same day, 11th May 1915 at Brighton. He declared his age to be 25 years and 10 months. He declared his mother Alice Cheesman of Laurel Cottage, Watersfield, Pulborough, West Sussex to be his next of kin. On 21st May, he was posted to 10th Battalion Royal Sussex Regiment for training at Colchester until 13th September 1915. He was allocated service number GS/6814. His record shows the number prefixed with the letters “GS”, which was used to signify that the soldier was conscripted for “General Service”. On 23rd September 1915 he was posted to France to join the 9th Battalion Royal Sussex Regiment. 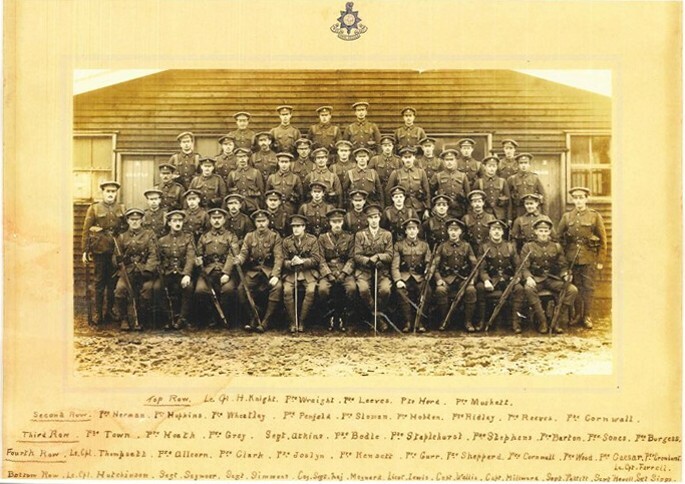 The 9th “Service” Battalion was raised at Chichester in 1914. At the time the 9th Battalion was already in France and had been so since 1st September and had moved up to the battle trenches at Vermelles on 25th September. The 9th had joined up with other battalions to become part of the 24th Division. The 24th Division was a completely untried unit and although it is unclear exactly what day Jack would have caught up with the Division he was probably thrown into “the thick of it” at Vermelles where they were ordered to advance on “Fosse 8”, a large and conspicuous mining slag heap. The Fosse was to be held at all costs despite several German attacks from heavy artillery and machine gun fire and a lack of food and water. The 9th Battalion held on until withdrawn to Sailly-Labourse during the night of 27th. The following months found the 9th Battalion at Proven near Ypres after several day of marching, trains and lorry journeys. The rains were constant and the trenches were flooded. The Battalion was busy filling in excess of 200 sandbags daily, a total of 5000 were required to stem the flooding. The men were exhausted and were receiving little respite from the trenches and training. The whole of December was spent in Houlle, some 35 miles west from the fighting zone. Intensive training continued. Christmas and the New Year was spent safely in that quiet area of France. January 1916 found Jack still with the 9th Battalion in France. It was at this stage that George Catt had joined the Battalion when they entered the trenches at Zouave Wood on the 18th where significant enemy shell and sniper fire was experienced for four days until relief arrived. The Battalion was so close to the enemy line that gas masks had to be worn day and night. The Battalion Heavy shelling continued into February near Hooge where the 9th were still occupying trenches. On 13th February the Germans put down a tremendous bombardment over the British front line causing a great deal of damage. 30 casualties along with several fatalities were recorded. On 14th February 1916 Jack Cheesman is promoted in the field to a Corporal. Jack is still 9th Battalion Royal Sussex Regiment attached to the 24th Division. March, April, May and June were relatively quiet until the 17th June when the Germans gas bombed the Battalions position. The Battalion was moved away after a tirade of shelling and enemy fire, only to return to the trenches on 20th June. The 6th July brought the Battalion out of the trenches for a period of rest only for them to return on 11th where on 20th they were relieved and moved by buses and trains away from the Ypres area and travelled to Montagne. August continued to see the 9th Battalion in the thick of it, and was involved in hand to hand fighting in the village of Guillemont where over the course of two days casualties amounted to 7 officers and 183 other ranks. After 7 days rest they were again in the trenches where they were attacked by the Germans after heavy bombardment on 31st August. The 9th managed to hold on and repulsed the attacking party. 30 men were killed and 80 injured. The problem was exasperated by the complete lack of food and water during continued attack. September saw the Battalion moved by trains and lorries to Camblain-l’Abbe and finally on 24th to Villers-au-Bois. Page 10477 6814 Cpl.J Cheesman R. Suss. R.
Honors for Brighton Policemen: In the list of NCO’s and men of the Royal Sussex Regiment awarded the Military Medal which appeared in Saturdays Sussex Daily News, the names of Corporal R Lintott, Corporal J Cheesman, and Lance Corporal W Clinch were included. It is interesting to learn that these gallant men were all in the Brighton Police Force. It can now be proved that the Trio of Cheesman, Clinch and Lintott were together at the time of an amazing act of bravery between the three of them, which earned them the Military Medal each. Copied below is a newspaper cutting taken from the Observer and West Sussex Recorder dated 22nd November 1916. The beginning of 1917 found Jack on leave during 10th January to 20th January. He did not return to England and the destination of his leave is unknown. February was also relatively quiet. The Battalion was at Hesdigneul, where they had “moved out” to rest. March found the 9th Battalion back in the thick of it, returning to the line in the area of Arras where an enemy attack was thwarted. The German bombardment caused several casualties. April came in with a blast of cold weather, snow blizzards and fighting. In full action on 12th and 13th the British attacked the German positions in Bois-en-Hache. At the cost of 60 Battalion casualties, through a snow blizzard, the enemy’s first and second lines were taken. The ground had been churned up through shelling activity and snow into a sea of mud. The Battalion finally was given a well-earned rest falling back to Estree Blanche for a week of reorganisation which ended with a forced march to Houchin where during may they rested, trained and integrated new men. June 1917 saw one of the most successful British attacks of the war at the Battle of Messines Ridge. The 9th were fully involved on the 7th despite gas attacks and shelling. The battalion suffered 134 wounded with 3 men missing. This action was the prelude to the 3rd Battle of Ypres. On 13th June 1917 Jack was transferred as a Corporal to the Military Foot Police under Army Council Instruction No. 1733. The instruction is long and tedious but in short explains that the system of policing such large numbers of Soldiers at home and abroad required trained Police Officers. As a result it would appear that soldiers who were Police Officers prior to the war were being transferred to either the MMP (Mounted Military Police) or MFP (Military Foot Police). The detection of crime, and the arrest of offenders. The maintenance of order under all circumstances. The surveillance and control of all civilians and followers within the area occupied by their formations. Assisting in maintaining march discipline of troops and transport and in regulating traffic. The custody of prisoners of war until their transfer to railhead or to a P.O.W. working company. The protection of the local inhabitants against acts of violence on the part of soldiers or followers. In addition there were numerous special duties they were expected to see to, among which were : Taking measures to prevent troops getting into contact with undesirable characters—prostitutes, enemy agents, provocateurs, etc. Ill-treatment of animals. Civilians found within the lines without passes or identity cards. Plundering, marauding and looting. Ill-treatment of inhabitants. Unauthorized cameras and photography. Collecting and returning of horses. Careless talk and the apprehension of anyone giving military information. Arrest of suspicious individuals. The shooting of dogs found unattended near the forward lines, and search of the bodies for messages, etc. Seizure of carrier pigeons. Surveillance for means of communication with the enemy. Jack was temporarily transferred to the Military Foot Police for the duration of the war. On 9th May 1917 he joined up with the 2nd Army at the Adjutant-Generals Office in Rouen, probably for training. Jack is promoted to Lance Corporal on 17th June. He remains until 8th December 1917 where he joins the 3rd Army in the field. At some stage Jack is in hospital, although no details are available. He is shown in his Army Records having been sent on leave to the UK 10th to 23rd February 1918. On 30th April 1918 he is transferred to 1st Army he appears to have been discharged from hospital. On 14 December 1918 Jack is again discharged from hospital and rejoins the 1st Army. On 10th January 1919 Jack is sent on leave to the UK until 24th January 1919. He returns to the 1st Army in France and remains until 14th July 1919 when he returned to UK for demobilisation. Jack was medically examined whilst in Valenciennes, France on 7th Jult 1919 where he signs that he has no disabilities. Jack is transferred to Class Z reserves at Aldershot on 11th August 1919 having arrived at the dispersal unit Crystal Palace on 18th July 1919. His address on demobilisation is Laurel Cottage, Watersfield, his mother’s home address. Jack was awarded the Military Medal along with the 1914-1915 Star, The British War Medal and Victory Medal. 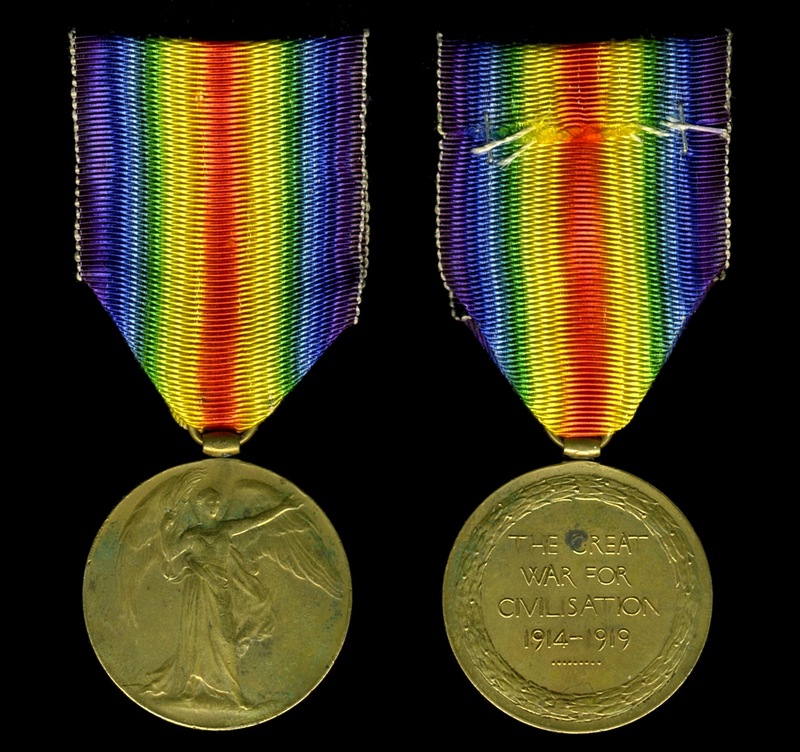 The medals below are not the actual medals issued to Cheesman. It is known that Jack rejoined the Brighton Borough Police after returning from the War. The Chief Constable of Brighton Borough Police, William Gentle reported to the Brighton Watch Committee that Jack Cheesman reported for duty on 14th August 1919. The 1939 Register is our next insight to Jack and finds him living at 68 Mackie Avenue, Brighton. Jack is shown as being born on 19th September 1889 aged 50yrs. He is shown as a retired Police Officer and a Police 1st reserve.Jack is living with wife 47 year old Laura Ellen Berry who he had married in 1919 at Ipswich. It is not known at present how they met.Also living at 68 Mackie Avenue was his daughter Elsie Davey (nee Cheesman born 28th February 1921 along with a son Denis Cheesman 20th April 1923. Jack died on 9th May 1961 at 71yrs of age. His death is registered in Brighton. Laura Cheesman died 16 years later in 1977 aged 84yrs.